Robert Gale on Sugar N My Shayk. Ted Petit Photography. Robert Gale, Conways, S.C., and Lisa Taylor, Pilot Point, Tex., tied as co-champions of the 2019 NCHA Kit Kat Sugar Super Stakes Amateur Unlimited riding Sugar N My Shayk, by Kit Kat Sugar, and Reycan In The Cash, by Dual Rey, respectively. 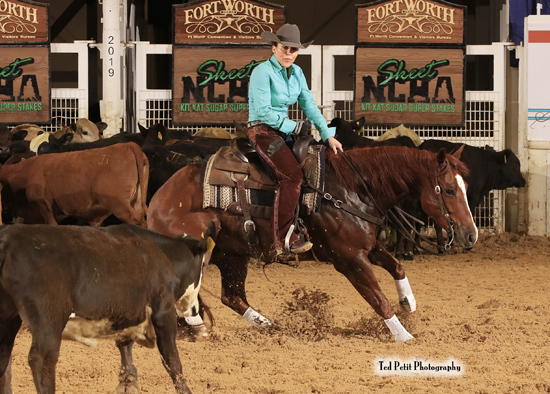 Stacie McDavid, Forth Worth, Tex., placed third with 217.5 points aboard DMACS Pink Martini, by Woody Be Tuff. 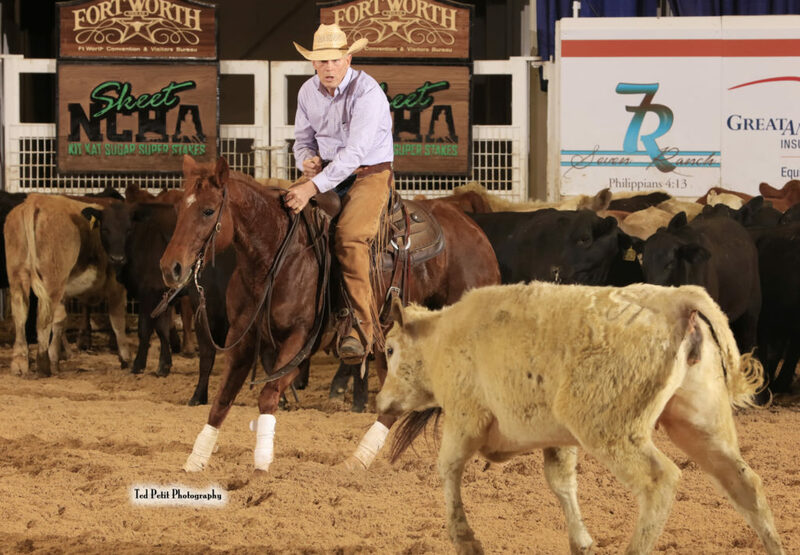 Robert Gale, the NCHA earner of $150,385, was a 2018 NCHA Derby Amateur Unlimited finalist riding Couture De Force LTE $19,966, by Stylish Wood, and placed fifth in the 2013 Breeders Invitational Classic Amateur Unlimited, his previous richest performance, on Shorty Boonsmal $111,238, by Peptoboonsmal. The Amateur Unlimited co-championship represents Sugar N My Shayk’s first limited age event. The Kit Kat Sugar daughter, bred by Lori Gale, is out of Short A Shay $175,691, third-paced in the 2006 NCHA Open World Championship standings, and dam of Couture De Force. Lisa Taylor on Reycan In The Cash. Ted Petit Photography. 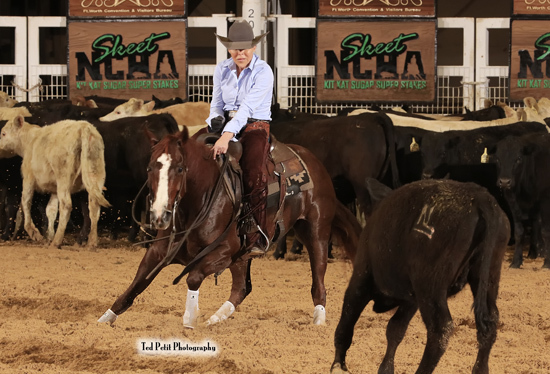 Lisa Taylor, the NCHA earner of $187,773, was reserve champion of the 2016 NCHA Super Stakes Classic Non-Pro Limited on Scootin In Stilettos LTE $45,505, by Smart Lil Scoot, and placed sixth last year in the Super Stakes Classic Non-Pro Limited with Rydin Dirty LTE $36,719, by Whiskeynadirtyglass. Reycan In The Cash LTE $74,690 was reserve champion of the NCHA Futurity Open Limited under Greg Wright and has placed third in three major 2019 limited event Open finals with Lloyd Cox. Out of Cancan Kitty, an unshown daughter of High Brow Cat, Reycan In The Cash is a full brother to Cancan Reyvolution LTE $176,682 and Kitty Can Dual LTE $108,297. In addition to DMACS Pink Martini, Stacie McDavid, the NCHA Non-Pro Hall of Fame earner of $1,027,141, showed DMAC Kodiak LTE $25,377, by Metallic Cat, in the Super Stakes Amateur Unlimited Finals. She was also a finalist in the Super Stakes Classic Amateur Unlimited with DMAC Piccolo Pete LTE $147,672, by WR This Cats Smart, and with DMAC Bellini Martini LTE $58,907, by High Brow Cat. DMACS Pink Martini, is out of Shesa Dirty Martini LTE $132,492, by Hes A Peptospoonful, a three-quarter sister to 2007 NCHA Horse of the Year Copaspepto LTE $417,440, and a half-sister to Stylish Martini LTE $361,920. Robert Thigpen on Metallic Rita. Ted Petit Photography. 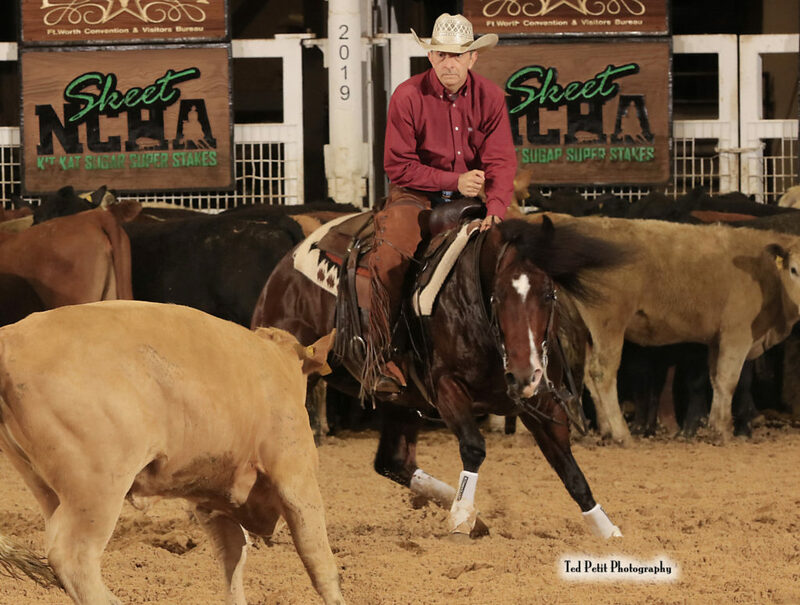 Robert Thigpen, Chilton, Tex., scored 215.5 points on Metallic Rita, by Metallic Cat, to win the 2019 NCHA Kit Kat Sugar Super Stakes Amateur Finals. John Rockey, Palmdale, Calif., and Jose Ignacio Sigala, Weatherford, Tex., tied as co-reserve champions with 214 points, riding Sweet Toothe, by Kit Kat Sugar, and Sweet Dark Venum, by Sigala Rey, respectively. Ken Schultz, Sacramento, Calif., posted 213.5 points, the third-highest score on Calvin Baloo, by Lil Catbaloo. Robert Thigpen, the NCHA earner of $182,595, and Metallic Rita LTE $18,023 earned their first major check as finalists in the 2018 NCHA Futurity Amateur, where they placed eleventh, earned fourth-place money in the Amateur Senior division, and were semi-finalists in the Amateur Unlimited. Thigpen’s second-richest individual payout came as reserve champion of the 2016 NCHA Derby Amateur, where he showed Barbies Blue Cat LTE $48,115. Metallic Rita was bred by Thigpen out of Pats Little Senorita LTE $31,801, a 2006 NCHA Super Stakes Amateur Finalist shown by Thigpen, and the dam of Ruby Rita LTE $72,926, a full sister to Metallic Rita. John Rockey on Sweet Toote. Ted Petit Photography. 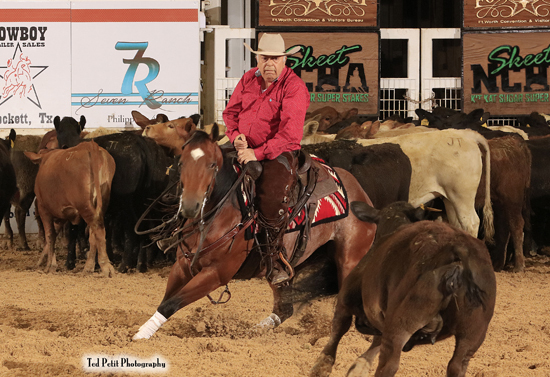 John Rockey, the NCHA earner of $316,601, was the 2018 NCHA Super Stakes Amateur reserve champion and Amateur Unlimited finalist on Dureyngo Kid LTE $119,501, who he also showed as a finalist in Saturday’s Super Stakes Classic Amateur Unlimited. It was his 2018 NCHA Futurity Amateur Unlimited championship win on Sweet Toothe, however, that surpassed Rockey’s other accomplishments. Sweet Toothe LTE $45,663, by Kit Kat Sugar, is out of One Sweet Sis LTE $94,925, by One Time Pepto. Jose Ignacio Sigala on Sweet Dark Venum. Ted Petit Photography. 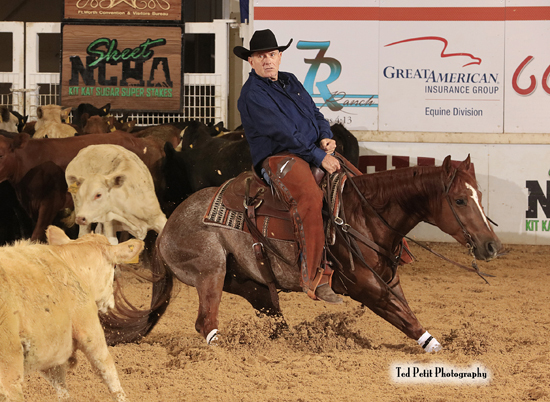 Jose Sigala, the NCHA earner of $76,566, showed Grenache Grape LTE $13,094, by Sigala Rey, to place fifth in the 2018 NCHA Super Stakes Amateur Finals. Sweet Dark Venum, also sired by Sigala Rey and bred by Sigala, is out of Starsredfeather LTE $36,738, the dam of Sweet Dark Venum’s full sister Secreytariat LTE $44,850. Sweet Dark Venum was also shown by Isidro Sigala to place tenth in the 2019 Super Stakes Amateur Unlimited Finals. Ken Schultz, the NCHA earner of $282,189, tied himself in tenth place, in the 2018 NCHA Futurity Non-Pro Limited Finals riding Calvin Baloo, by Lil Catbaloo, and Rockin Those Tricks, by Rockin W. He also rode Calvin Baloo as a 2018 Futurity Amateur Unlimited finalist and an Amateur semi-finalist, and placed eleventh in the Amateur Finals with Rockin Those Tricks. Additionally, Schultz and Calvin Baloo tied for fifth in the Super Stakes Amateur Unlimited. Bonnit Martin on Reysin Kittens. Ted Petit Photography. 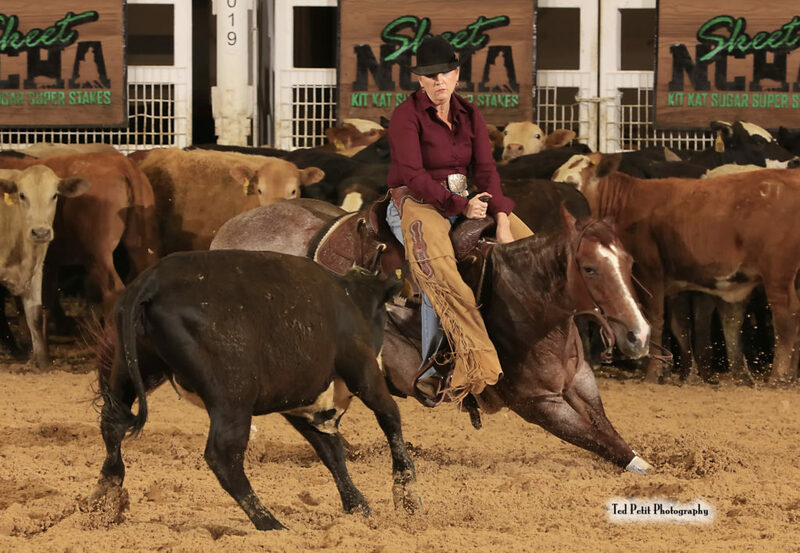 Bonnie Martin, Las Vegas, Nev., clinched her run in the NCHA Kit Kat Sugar Super Stakes Classic Amateur Unlimited Finals with a 225-points win aboard Reysin Kittens, by Dual Rey. Langston Pattillo, St. Elmo, Ill., scored 222 points on High Stylin CD, by High Brow CD, for the reserve championship, while German Lugo, Gainesville, Tex., placed third with 219 points aboard Mamas Stylish Sophie, by One Time Pepto. Bonnie Martin, the NCHA Non-Pro Hall of Fame earner of $1,013,920, had also shown Reysin Kittens LTE $197,947 earlier in the week, as a finalist in the Super Stakes Classic Non-Pro Finals, and Grant Setnicka showed the 6-year-old gelding as a finalist in the Super Stakes Classic Open Finals. Reysin Kittens was bred by Frank and Bonnie Martin out of the High Brow Cat daughter Kittens LTE $270,700. Martin showed Kittens as a non-pro or amateur champion in nine limited age events. The High Brow Cat daughter has produced nine NCHA earners of $582,639. Langston Pattillo on High Stylin CD. Ted Petit Photography. 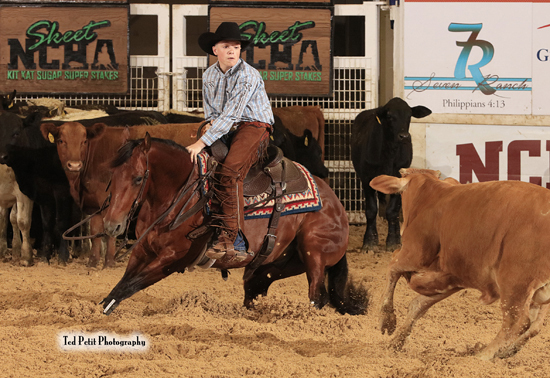 Langston Pattillo, the NCHA earner of $250,809, and 6-year-old High Stylin CD LTE $150,296 have won seven limited age events, including the 2019 Bonanza Classic Non-Pro and the Bonanza Classic Amateur Unlimited. 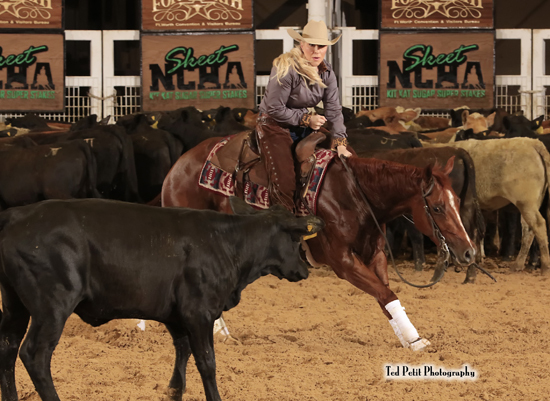 They also claimed the 2018 NCHA Super Stakes Classic Non-Pro Limited reserve championship and placed third in the 2018 Amateur Finals of the Super Stakes. In addition, Pattillo was a finalist in the Super Stakes Amateur Unlimited riding the Kit Kat Sugar daughter Kit Kat Kisses LTE $17,140, who he also showed to place in the 2018 NCHA Futurity Amateur Finals and as an NCHA Futurity Non-Pro Limited finalist and Futurity Non-Pro Semi-Finalist. High Stylin CD, who earned the title of 2018 NCHA Amateur Horse of the Year, is out of Stylin Playgirl LTE $203,277, who placed third in the 2009 NCHA Super Stakes Non-Pro with Dustin Adams. German Lugo, the NCHA earner of $166,554, won the 2018 West Texas Futurity Amateur Unlimited and the 2018 Cotton Stakes Amateur Intermediate showing Mamas Stylish Sophie LTE $82,911, by Dual Rey. This year, the pair placed fourth in the Bonanza Classic Amateur Unlimited, and Lugo won the Abilene Spectacular Classic Amateur Unlimited with This Chics Hot LTE $39,481, by Spots Hot. In addition, Lugo also showed King Ragnar Lothbrok, by Metallic Cat, to place thirteenth in Saturday’s 40-horse Super Stakes Amateur Unlimited Finals. Katherine Goodfried on Trouble N Roan. Ted Petit Photography. Katherine Goodfried, Fort Worth, Tex., scored 219 points, riding Trouble N Roan, to claim the NCHA Kit Kat Sugar Super Stakes Classic Amateur championship. Lew Byars, Mt. Hope, Ala., scored 215.5 points with Twisted Metal for the reserve championship, and Jane Mancuso, Plantersville, Tex., placed third with 215 points on Metalic Pistol. All three horses were sired by Metallic Cat, who was represented by 10 of the 30 Classic Amateur finalists. Katherine Goodfried, the NCHA earner of $85,545, showed Trouble N Roan earlier this year to place seventh in the Bonanza Amateur Classic, and last year as a finalist in the NCHA Super Stakes Amateur Finals. Six-year-old Trouble N Roan is a full sister to 6-year-old Metallic Fox LTE $17,471, who Goodfried showed to win the 2017 NCHA Cotton Stakes Amateur and as reserve champion of the Non-Pro Cutting Amateur Classic. Trouble N Roan and Metallic Fox are out of Dainty Playgirl LTE $269,122, who won the 1998 NCHA Futurity Open championship under Ronnie Rice, showing for Gary and Mickey Goodfried. Lew Byars on Twisted Metal. Ted Petit Photography. Lew Byars, the NCHA earner of $74,047, and 2015 NCHA World Finals $50,000 Amateur winner on MK CD High Roller, showed Twisted Metal to place fourth in the 2018 Southern Futurity Amateur Classic. As a 4-year-old, Twisted Metal placed third in the NCHA Super Stakes Non-Pro Limited with breeder Charles Israel. Out of Some Kinda Twister LTE $58,298, by Freckles Fancy Twist, Twisted Metal is a half-brother to Twistful Thinking LTE $208,813, the 2015 NCHA Super Stakes Non-Pro champion under Cade Shepard. Jane Mancuso, the NCHA earner of $86,872, was an NCHA Super Stakes Classic Amateur finalist aboard Style N Motion, and placed sixth in the 2016 Super Stakes Classic Amateur Unlimited riding CR Missnjethro Woody, who also carried Mancuso to win the 2017 Augusta Futurity Classic Amateur Unlimited. Five-year-old Metalic Pistol LTE $34,690, who also carried Mancuso as a 2018 NCHA Derby Amateur finalist, is out of Silver Pepto Pistol LTE $117,977, a half-sister to $7.9 million-dollar sire Playgun. Glenn Barlow on Shez Shameless. Ted Petit Photography. Glenn Barlow, Gillette, Wyo., riding Shez Shameless, by Dual Rey, scored 219 points to tie Stacie McDavid, on DMAC Kodiak, by Metallic Cat (click here for details on McDavid and DMAC Kodiak), as the high-scoring rider and from the NCHA Kit Kat Sugar Super Stakes Amateur/Amateur Unlimited go-round. Tracey Woodward, Los Alamos, Calif., with 218.5 points riding homebred Jazzen, by Rascal Cats, was the second-highest scoring rider. McDavid, Barlow, and Woodward are Amateur Unlimited entrants. The 257-entry go-round determined qualification for 29 riders with 212.5 points or more to the Amateur Finals, and for 40 riders with 213.5 points or more to the Amateur Unlimited Finals, on Saturday, April 20. Marco Salvatori on Twisted Red Faye. Ted Petit Photography. 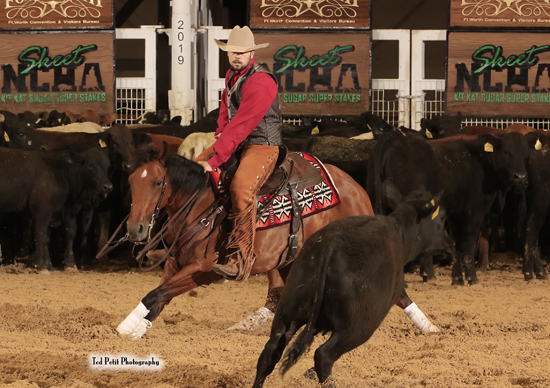 Marco Salvatori, Modena, Mo., riding Twisted Red Faye LTE $1,667, by Smart Rey Pepto, was the high-scoring Amateur entrant with 218 points. Salvatori, the NCHA earner of $69,438, is an international cutting champion. He was the Non-Pro reserve champion of 2015 NCHA European Championships riding Metallic Savanah LTE $61,771, by Metallic Cat, and placed fifth with Poundcake Deluxe LTE $81,194, by Cats Quixote Jack. He was also Open reserve champion of the 2011 NCHA Lyon World Series aboard Shesa Little Cat LTE $84,627. 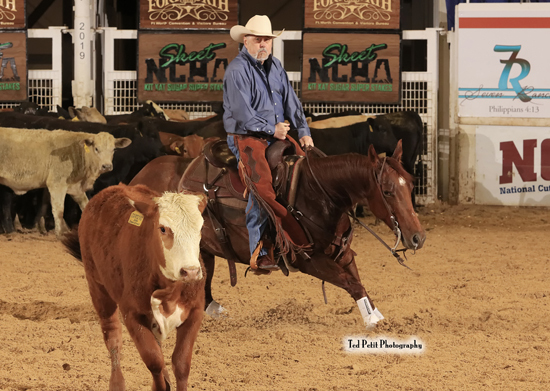 Glenn Barlow, the NCHA earner of $446,459, showed Shez Shameless LTE $24,453 to place fourth in the 2018 NCHA Futurity Non-Pro Limited Finals, and he was a finalist in the 2018 NCHA Super Stakes Amateur Unlimited, as well, riding Betty Bama LTE $18,797. Barlow was also a consistent money earner with Dual Rey-sired siblings Mr Connerey LTE $195,007 and Ferrarey LTE $140,449, bred by his Barlow Livestock, out of the High Brow Cat daughter Cats Good Intentions. In addition to placing in Non-Pro and Amateur divisions of the NCHA Super Stakes and Super Stakes Classic on both horses, Barlow also won the 2015 Breeders Invitational Amateur Unlimited with Mr Connerey, and the 2018 Breeders Invitational Amateur Unlimited aboard Ferrarey. Tracey Woodward, the NCHA earner of $272,851, showed Jazzen’s full sister, Just Rascal LTE $21,196, to win the 2018 Pacific Coast 3-Year-Old Amateur Unlimited, and to place as reserve champion in the Non-Pro and Non-Pro Limited divisions of the same event. In 2017, Woodward placed third in the NCHA Super Stakes Classic riding Stylish Look Bella LTE $174,016, by Dual Smart Rey. Jazzen LTE $3,066 was shown earlier this year to place seventh under Morgan Cromer in the Pacific Coast Winter Roundup Open Finals. Cromer also showed Just Rascal as an Open finalist in the 2018 Pacific Coast Futurity. Jazzen and Just Rascal are the first performers out of the Smart Lil Ricochet daughter Justbabe LTE $20,752, a full sister to Glows LTE $231,178, an NCHA Super Stakes and Super Stakes Classic Non-Pro finalist under Skip Queen. Stacie McDavid on DMAC Kodiak. Ted Petit Photography. 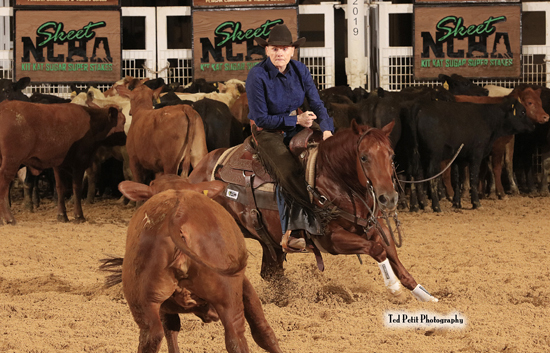 Stacie McDavid, Fort Worth, Tex., scored 219 points with the Metallic Cat gelding DMAC Kodiak on Wednesday, to top the first day of NCHA Kit Kat Sugar Super Stakes Amateur/Amateur Unlimited competition. Isidro Sigala, Weatherford, Tex., and Robert Thigpen, Chilton, Tex., tied with 217.5 points, the second-highest mark of the day, riding Sweet Dark Venum, by Sigala Rey, and Metallic Rita, by Metallic Cat, respectively. On Tuesday, showing DMAC Piccolo Pete, McDavid had scored 219 points, the third-highest advancing score to Friday’s Amateur Unlimited Classic Semi-Finals. The NCHA Non-Pro Hall of Fame earner of $990,971 and a past NCHA Super Stakes Amateur winner, in addition to DMAC Piccolo Pete LTE $147,672, McDavid also qualified for the Amateur Classic Semi-Finals with DMAC Bellini Martini LTE $58,907 and Pharoah And James $109,604. Stacie and her husband David McDavid also own DMAC Doggfather LTE $68,223, who Clint Allen showed as a finalist in the in the Super Stakes Open Finals on Saturday, April 6. Additionally, David McDavid qualified for Friday’s Amateur Unlimited Semi-Finals aboard Pharrel LTE $65,340, by Metallic Cat. he qualified for Friday’s Amateur/Amateur Unlimited Semi-Finals . Sweet Dark Venum, bred by Jose Ignacio Sigala out of Starsredfeather LTE $36,738, is a full sister to Secreytariat LTE $44,850..
Robert Thigpen, the NCHA earner of $182,595, first showed Metallic Rita LTE $18,023 as a finalist in the 2018 NCHA Futurity Amateur and a semi-finalist in the Amateur Unlimited. Grant Setnicka also showed the Metallic Cat daughter as a finalist in the 2019 Abilene Spectacular, while Thigpen placed seventh with Looks Metallic LTE $15,631, by Metallic Cat, in the 2019 Cattlemen’s Derby Amateur Finals and as reserve El Ranch Futurity 3-Year-Old champion. Thigpen bred Metallic Rita out of the Little Pat Uno daughter Pats Little Senorita LTE $31,801, who he showed in the 2006 NCHA Super Stakes Amateur Finals. Metallic Rita and Ruby Rita LTE $72,926 are full sisters. 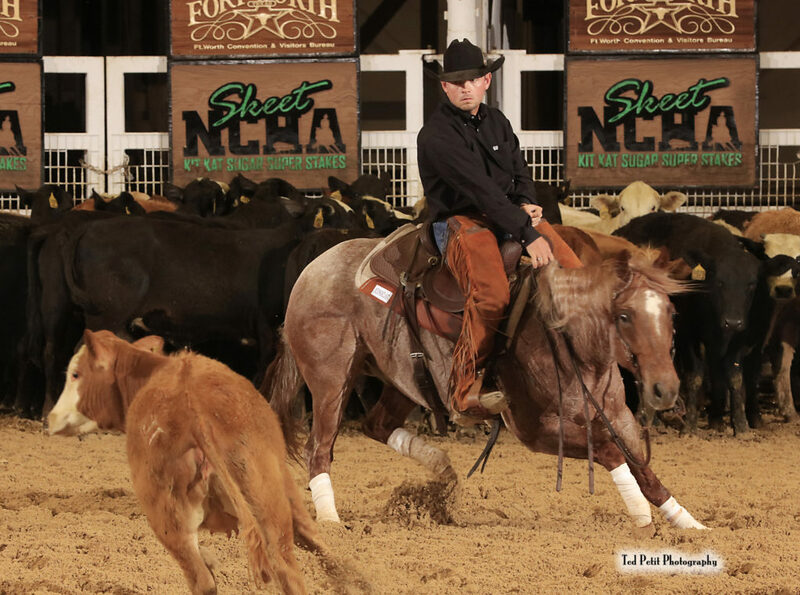 Grant Setnicka showed Ruby Rita to place sixth in the 2018 NCHA Super Stakes Open Finals and to earn first-place money in the Open Novice division.